A refreshing scent of forest pinewood, pleasant to humans and accepted by cats is a characteristic feature of the Super Benek gravel green forest. Recommended especially for racial or domesticated cats. This fragrance acts gently and stimulates masking the unpleasant odors coming out of the cuvette. 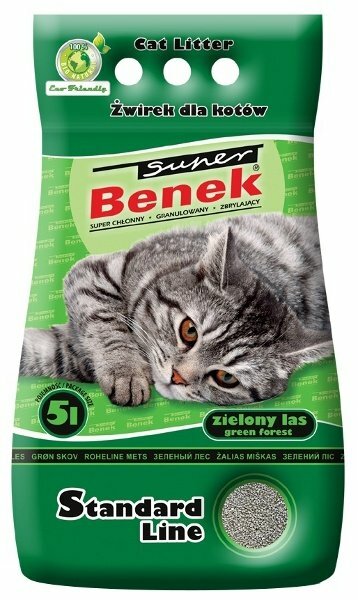 The hygienic jars for the Super Benek cats from the Standard line are products characterized by regular, coarse grains of 2-5 mm. Thanks to this grain size, the grit provides the best protection against spreading grit. Litter very effectively absorbs liquids and unpleasant odors providing good antibacterial protection. After contact with liquids, gravel grains combine to form regular, compact nuggets. 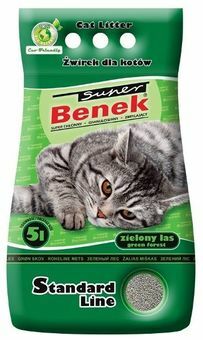 Super Benek Standard gravel The Green Forest is very absorbent, made of non-dusting granulates that do not adhere to the bottom of the cuvette.